Follow Us on Facebook Cover photo from Michael Ash. Mountains were sacred to ancient Israelites and were like natural temples. Hence, Moses ascended Mount Sinai to speak with the Lord (Exodus 19:3), and Jesus gave his famous sermon after he and his disciples had also gone up “into the mountain” (Matthew 5:1, Greek eis to oros.). And many people shall go and say, Come ye, and let us go up to the mountain of the Lord, to the house of the God of Jacob; and he will teach us of his ways, and we will walk in his paths; for out of Zion shall go forth the law, and the word of the Lord from Jerusalem (2 Nephi 12:2–3; Isaiah 2:2–3). As Jeffrey R. Chadwick has recently stressed, Isaiah’s primary concern in this prophecy was the temple in Jerusalem in the last days. Matthew Roper and John Gee have pointed out that because the land of Nephi, where his people built their temple (2 Nephi 5:16), was at a higher elevation, it would have been easy for Nephi to liken this prophecy to his situation and his people. Figure 2 Panorama from South Temple taken in 1912. Image via Wikimedia Commons. Since it opened in April of 2000, Latter-day Saints from around the world have poured into the Conference Center to learn the ways of the Lord, be taught his law, and hear the word of God. So, how can all these meanings be correct? From these several examples, both ancient and modern, it becomes clear that in this case, and often, a prophecy may have multiple applications. Many of Isaiah’s prophecies have numerous meanings and have been fulfilled in different ways at different times. Why is this so? One reason may be the expansive foresight of Isaiah. Another reason may be found in the universal applicability of scripture. People from all walks of life, from all kinds of different times and places, can relate to the scriptures and liken them to their lives. Nephi “likened” Isaiah’s words to his own people, probably seeing his own temple as a house of the Lord. At the same time, he encouraged all his readers to liken Isaiah’s teachings to themselves (2 Nephi 11:2, 8). Nephi recognized that many of Isaiah’s prophecies “shall be of great worth unto them in the last days” and recorded them for the good of those living in this time, long after his own (2 Nephi 25:8). Perhaps following Nephi’s lead and “likening” Isaiah, Latter-day prophets and apostles have recognized fulfillments today in various ways. Ultimately, other fulfillments are still in store. The final fulfillment of Isaiah 2:2–3 (2 Nephi 12:2–3) will likely come in the millennial day, the very point at which Nephi ends his interpretive sayings about the Isaiah chapters he has just quoted (see 2 Nephi 30:7–18). At that time, those who are “scattered” will “begin to gather” and “the things of all nations shall be made known; yea, all things shall be made known unto the children of men” (2 Nephi 30:7, 16). Jeffrey R. Chadwick, “The Great Jerusalem Temple Prophecy: Latter-day Context and Likening Unto Us,” in Ascending the Mountain of the Lord: Temple, Praise, and Worship in the Old Testament, ed. David R. Seely, Jeffrey R. Chadwick, and Matthew J. Grey (Salt Lake City and Provo, UT: Deseret Book and Religious Studies Center, 2011), 367–383. Elder Robert D. Hales, “Out of Darkness into His Marvelous Light,” April 2002 General Conference Address, online at lds.org. Donald W. Parry, Visualizing Isaiah (Provo, UT: FARMS, 2001). President Gordon B. Hinckley, “This Great Millennial Year,” October 2000 General Conference Address, online at lds.org. Elder LeGrand Richards, “In the Mountain of the Lord’s House,” April 1971 General Conference Address, online at lds.org. L. Michael Morales, “The Tabernacle: Mountain of God in the Cultus of Israel,” in Ancient Temple Worship: Proceedings of the Expound Symposium, 14 May 2011, ed. Matthew B. Brown, Jeffrey M. Bradshaw, Stephen D. Ricks, and John S. Thompson (Orem, UT and Salt Lake City, UT: Interpreter Foundation and Eborn Books, 2014), 27–70. Book of Mormon Central, “Why Does Nephi Always Go Down to the Wilderness, and Up to Jerusalem? (1 Nephi 3:4)” KnoWhy 6 (January 7, 2016). John Gee and Matthew Roper, “‘I Did Liken All Scriptures Unto Us’: Early Nephite Understandings of Isaiah and Implications for ‘Others’ in the Land,” in The Fullness of the Gospel: Foundational Teachings from the Book of Mormon, ed. Camille Fronk, Brian M. Hauglid, Patty A. Smith, and Thomas A. Wayment (Salt Lake City, UT: Deseret Book, 2003), 58. Donald W. Parry, Visualizing Isaiah (Provo, UT: FARMS, 2001), 98. D&C 52:11, 84:97, 109:59... "...cut short in righteousness..."
I myself have used these two verses to point to the Salt Lake Temple/Salt Lake City as being the fulfillment of these two verses. However, the one thing that is usually not discussed is the last phrase of the second verse: “. . . and the word of the Lord from Jerusalem.” It should seem obvious that this part of the prophecy has not been fulfilled. The word of the Lord is NOT coming out of Jerusalem; the word of the Lord is coming out of Salt Lake City. The law, so far as I can see, is not coming out of anywhere. Law is generally viewed as being civil, while the word of the Lord is generally seen as being spiritual. 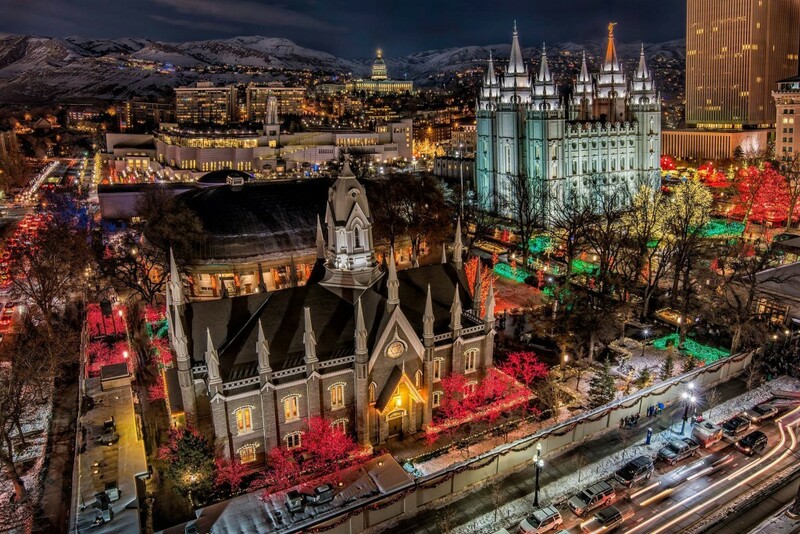 So, at best, the Salt Lake Temple/Salt Lake City is only a partial fulfillment of the prophecy. Also, we should be able to see that the two parts of the scripture (“. . . for out of Zion shall go forth the law, and the word of the Lord from Jerusalem”) are inextricably linked together. When one part is fulfilled, so then is the other. Therefore, to me, these two verses are a millennial prophecy, at least in its total fulfillment. This sounds more like when the New Jerusalem has been built up and Old Jerusalem has been reestablished as Christ’s, and not before then. We don’t know what the New Jerusalem geology will look like after the global earthquake occurs when every mountain and island shall be moved out of its place (see Revelation 6:12-17). It could look drastically different, even mountainous, if you will. And this is to occur just prior to year seven thousand, at least, as far as the Revelation chronology is concerned. Thus, while we can view these verses as a temporary fulfillment at best, I believe the total fulfillment will occur after the New Jerusalem is established and the Old Jerusalem has become Christ’s and not before then.